This coming Wednesday marks the 40th Anniversary of the release of the legendary Monty Python film, Holy Grail. 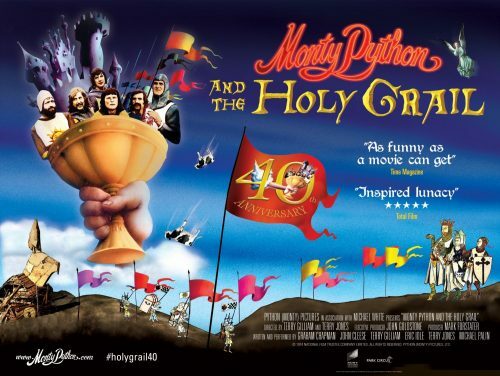 Commenting on the release of the film and accompanying documentary featuring a sing-a-long element, Michael Palin said, “It’s almost unbelievable to think it’s been 40 years since the Holy Grail was made. 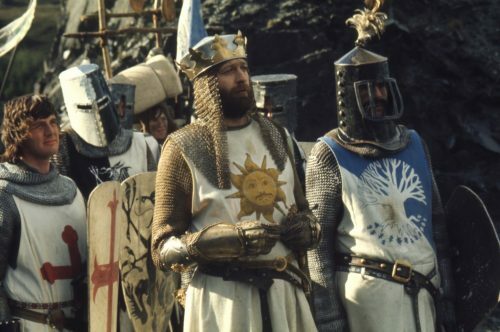 Monty Python is on a medieval quest in their first feature film Monty Python and The Holy Grail. England 932 A.D. and King Arthur accompanied by his trusty servant Patsy is seeking Knights to join his Round Table at Camelot. Arthur confronts two guards preoccupied with swallows, argues with a group of constitutional peasants, challenges a Black Knight who comes apart at the seams and witnesses the outing of a witch before enrolling his first Knight, Bedevere the Wise. Other knights follow: Sir Lancelot the Brave, Sir Galahad the Pure and the not-quite-so-brave Sir Robin. Avoiding the singing dancers of Camelot, Arthur and his Knights are inspired by God to quest together for the Holy Grail. But taunted and humiliated by the French, they decide go their separate ways. Sir Robin is confronted by a Three-Headed Knight, Sir Lancelot hacks his way through a wedding to save a damsel in distress, Arthur and Bedevere, warned by a Soothsayer, meet the shrubbery loving Knights of Ni while Sir Galahad almost falls to the temptation of the virgins of Castle Anthrax. The Knights join up again and after an arduous journey encounter Tim the Enchanter who leads them to the cave, guarded by a foul creature, wherein an ancient inscription reveals the whereabouts of the Grail. The Bridge of Death claims its victims and only Arthur and Bedevere reach the final resting place of the Holy Grail, only to be thwarted by old adversaries.